[map] Northeast of the Allens Crossroads community on US-231. In the middle of a square of land formed by four roads: Union Grove Road to the north, Midway Road to the south, Allens Cross Road to the east and Green Briar Cove Road to the west. [Image] Image of the RDS text from an Insignia HD portable, showing the Radio Text and PS (call sign) fields, from June 2017. This station signed on in the summer of 1968, put on the air by Blount County Broadcasting Service as the FM companion of Oneonta's WCRL on 1570 kHz. The station originally broadcast on 97.7 MHz with 990 watts from Red Mountain (not the one in Birmingham!) with a Bauer 607 transmitter feeding a Jampro JCP-2 antenna. The call sign was WKLD. In the early days, the FM simulcast the AM about half the time and originated programming the other half. The format in the early days was not known. From the early 90's, both the AM and FM began simulcasting full time, and both were listed as having an Adult Contemporary music format in the Broadcasting Yearbook editions from this era. In 1993, the station received a boost in power to 4 kW from the same transmitter site. At some point in the late 90's the station transitioned away from simulcasting the AM and began airing a Country music format from the ABC "Today's Best Country" satellite format. They boosted power again, to 6 kW, in 1999. Great South Wireless purchased the station in 2008, with a plan to move it to the Huntsville market. After the purchase, the station dropped the Country for a simulcast of sister station WCRL's satellite-fed Nostalgia format. Great South originally shot for a May target date to sign the new facility on, but missed that mark. The call sign changed to WZNN in August 2009. The station finally signed on from the Union Grove-licensed facility in December 2009, testing with a Variety Hits music format. With this sign-on, Blount County lost its only local FM signal. Only a few months after signing on with music, the station filed to go silent in March 2010. It didn't sign back on until late June 2010, when it was heard carrying Fox Sports programming with Cubelic and The Kid morning show. 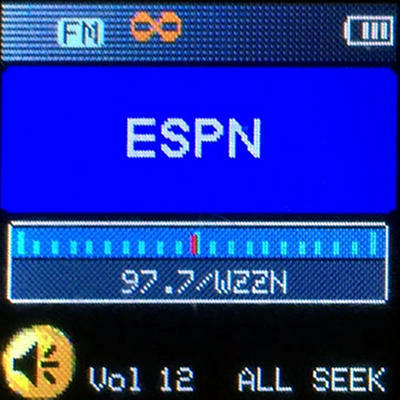 The station dropped the local morning show and Fox Sports for ESPN programming in August 2012. The station was sold by Great South Wireless to Neighbors Broadcast Company in January 2019, for $535,000. Neighbors had been running the station under a Time Brokerage Agreement at the start of the year. The buyer, William "Wes" Neighbors, is an afternoon host on the station, and a former football player for the University of Alabama and the NFL.